You're looking down into Prinsengracht Canal, up along toward the house Anna Frank hid in during the war. 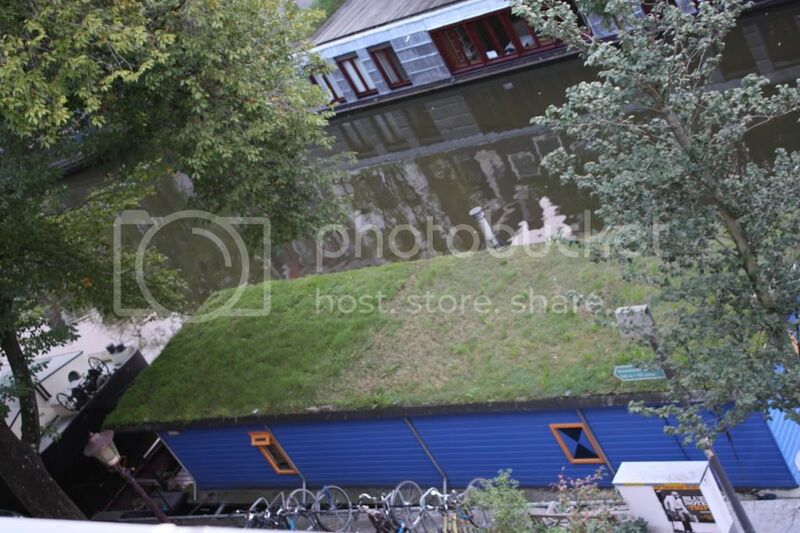 Houseboats on two sides. Originally houseboats were not regulated, so all kinds of them sprang up in response to the housing space crunch in the city. These days / years, you have to hook up to the city water and sewer pipelines in the canal walls and buy a boat license, all that stuff. Many of them do not move very much at all, they're permanently anchored and are residences, some of them house families. This one has live grass growing out of a bed of earth on top of its "roof" and I thought that was majorly cute. The center part of all the canals is kept free for boats that actually move up and down them ... including sightseeing vessels. About 70% of the country is two meters below North Sea level, so it was originally under water and the dam / canal systems were started centuries ago to control where the water could be channeled to flow, so that land could be dried out and built upon. Of course I think this was garden-variety grass. But here I guess you never know. Cool! What a great shot! Grass growing on the roof! Imagine mowing the lawn!